BMU Announces Solar Farm Phase III & IV Expansion is now generating electricity. Berea Municipal Utilities announces that additional solar panels are now available for lease from the Berea Solar Farm! Berea Solar Farm consists of a total of 246 solar panels. Phase I & II section consists of 120 panels, which have been leased, installed, and are generating electricity and customers’ accounts will receive the credits. 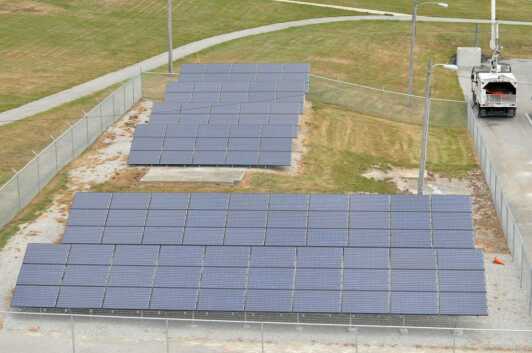 The Phase III & IV 126 panel expansion, was officially placed in operation on July 08, 2014 and has more than doubled the size of the solar farm located on the grounds of the BMU on Harrison Road. Berea Municipal Utilities (BMU), with support from the City and an EECBG grant, established the Berea Solar Farm Phase I and II – arrays of photovoltaic (PV) panels to generate electricity. The purpose of the Solar Farm is to provide BMU customers who want to invest in local solar generation an opportunity to do so. The program invites community members to come together in moving Berea toward a better energy future. Leasing for the first 60 panels began October 25, 2011. Those 60 were leased out in 4 ½ days, and the decision was made to offer a second 60 panel array as part of the same construction project. All of the panels were leased in less than four months. A very promising beginning! Located on the grounds of the BMU building, all of the 246 solar panels – the 120 originals and the 126 new ones – are now generating electricity. One way that sustained growth in the Berea Solar Farm may occur is for participants – whether residents, small businesses, churches, or schools – to plan for a gradual increase in their panel holdings in order to reach some goal they have set for the extent to which their total electricity use is offset by their solar panels’ generation. This announced expansion of the Berea Solar Farm is the first opportunity to move toward achieving such goals. How does the leasing work? Customers (and others) are invited to lease solar panels (no limit on number) for a one-time lease fee of $750 per panel. This one-time fee covers a 25-year period. In return, customers will receive credit every billing period for the electricity generated by their panels. In this way participating customers gain access to solar generation at an excellent price (about $3.00 per installed watt). The panels are owned and maintained by BMU and located on city property with excellent orientation to the sun and no shading. Although anyone may lease panels, only metered residential customers (class 1 or 9) and commercial customers (class 2 or 3) may receive Panel Production Credit (i.e., credit on their electric bills for the electricity produced by these Solar Farm panels). For each panel leased, a location within the BMU service territory must be specified. 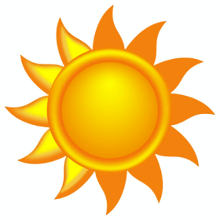 Who may want to lease solar panels? are attracted to helping Berea demonstrate the viability of one model for how local communities in Kentucky and elsewhere to respond to the need for leadership in the face of pressing global, national and statewide energy problems. BMU is currently accepting applications for solar panels. Complete a License Agreement and return it with a check made out to BMU for the total amount due. Each panel is $750. You can pick up a License Agreement at the BMU office or download the contract here. Please deliver your completed License Agreement and check payment – weekdays between 9:00 -12:00 and 1:00 -4:00 to the BMU contractor’s office (to the right of the main customer service entrance). Please call to confirm Terri Brumley, BMU Operations Administrative Assistant will be available (859-986-4391) or drop it off and a copy will be mailed to you at a later date. You may also mail your completed contract and payment to Terri Brumley’s attention at Berea Municipal Utilities, 200 Harrison Rd, Berea, Kentucky, 40403-0926. Full payment and a signed License Agreement are required to complete the leasing transaction.